Margaret Wade LaBarge was born in New York City and moved with her family to Connecticut at age 10. She attended a convent school before enrolling at Radcliffe College, from which she graduated Phi Beta Kappa in 1937. She then went to Oxford University, where she read medieval history with Sir Maurice Powicke, Regius Professor of Modern History. In 1940, she married Raymond LaBarge, a fellow Oxford student, with whom she moved to Canada and had four children. He became a federal civil servant. She began her academic career in the 1950s as a lecturer in medieval history at Carleton University and continued her research on Simon de Montfort, the subject of her graduate thesis. This biography, published in 1962, was the first of her nine major books, most of which are still in print and read today. She became one of the first historians to celebrate the achievements of medieval women. She was the founding president of the Canadian Society of Medievalists or Société canadienne des médiévistes. 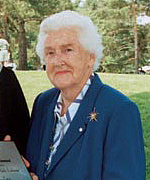 In 1982, she was awarded the Order of Canada not only as an historian but also for her lifelong volunteer work in nursing and the care of the disabled and the elderly. She also received numerous other awards for both her academic and voluntary work and was elected a fellow of the Royal Society of Canada in 1988. Margaret Wade LaBarge is currently considered a "single author." If one or more works are by a distinct, homonymous authors, go ahead and split the author. Margaret Wade LaBarge is composed of 6 names. You can examine and separate out names.